Stainless steel snap shackle with jaw and clevis pin, pull release plunger, suitable for numerous applications in harsh marine environments. * Working Load refers to nautical applications. Available in 17.4 PH stainless steel. Product has quoted break load. 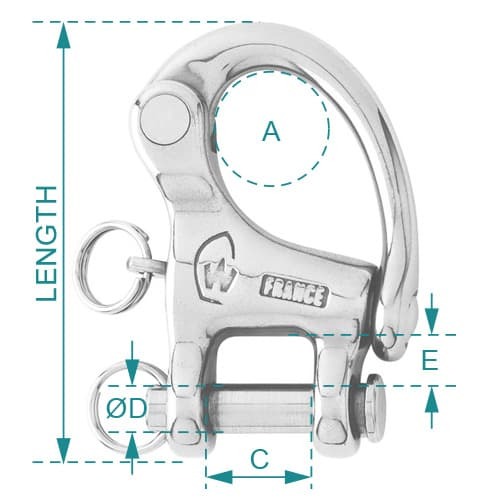 Snap shackle and jaw with incredibly high working and breaking loads. Forged in high resistance 17.4PH stainless steel, with a high quality finish. Plunger pin is set captive into the hook and cannot become detached. Easy snap opening by pulling the plunger pin. Designed and manufactured by renowned marine hardware specialist Wichard, France. Snap Hooks suitable for marine environments and a wide range of general applications.